Crystal Plus Oil is an odorless, tasteless, crystal clear, white mineral oil of the highest quality. Crystal Plus Oil is available in food grade and technical grade. Crystal Plus Oils are also available in low, medium and high viscosity. Great for use in Gel Candles, Wood Product Finishing, Lamp Oil, Knife Manufacturing, Meat Packers, Rain Gauges, Ceramics, Bee Mite Control and Many More applications. Call us today to discuss your application at 1-800-967-1931. Crystal Plus 70FG is an odorless, tasteless, crystal clear, food grade white mineral oil. Crystal Plus 70FG meets or exceeds requirements of US FDA regulation 21 CFR 172.878 and CFR178.3620(a) for direct and indirect food contact. It meets or exceeds standards of the US Pharmacopoeia (USP) and the National Formulary (NF). It meets standards for approval as H1 and 3H lubricants for use in food processing plants under the jurisdiction of the USDA. Crystal Plus 70FG is also Kosher approved. Crystal Plus 70FG is the lightest viscosity of mineral oil STE offers. Crystal Plus 70FG is great for use in Cosmetics, Health and Beauty, Bee Mite Control, and Many More Applications. Crystal Plus 70T is an odorless, tasteless, crystal clear, technical grade white mineral oil. It meets or exceeds requirements of US FDA regulation 21 CFR 178.3620(b) mandated for indirect food contact. Additionally this oil also meets USDA requirements for H-1 lubricants for incidental food contact. Crystal Plus 70T is the lightest viscosity of mineral oil STE offers. Great value for those applications that do not require food grade oil but still would like the same quality. Applications for Crystal Plus 70T include gel candles, Knife Manufacturing, Rain Gauges, Ceramics, and Many More. Crystal Plus 200FG is an odorless, tasteless, crystal clear, food grade white mineral oil. Crystal Plus 200FG meets or exceeds requirements of US FDA regulation 21 CFR 172.878 and CFR178.3620(a) for direct and indirect food contact. It meets or exceeds standards of the US Pharmacopoeia (USP) and the National Formulary (NF). It meets standards for approval as H1 and 3H lubricants for use in food plants under the jurisdiction of the USDA. Crystal Plus 200FG is also Kosher approved. Crystal Plus 200FG is the mid-range viscosity of mineral oil STE offers. Crystal Plus 200T is an odorless, tasteless, crystal clear, technical grade white mineral oil. It meets or exceeds requirements of US FDA regulation 21 CFR 178.3620(b) mandated for indirect food contact. Additionally this oil also meets USDA requirements for H-1 lubricants for incidental food contact. Great value for those applications that do not require food grade oil but still would like the same quality. Crystal Plus 200T is the mid-range viscosity of mineral oil STE offers. Crystal Plus 350FG is an odorless, tasteless, crystal clear, food grade white mineral oil. Crystal Plus 350FG meets or exceeds requirements of US FDA regulation 21 CFR 172.878 and CFR178.3620(a) for direct and indirect food contact. It meets or exceeds standards of the US Pharmacopoeia (USP) and the National Formulary (NF). It meets standards for approval as H1 and 3H lubricants for use in food plants under the jurisdiction of the USDA. 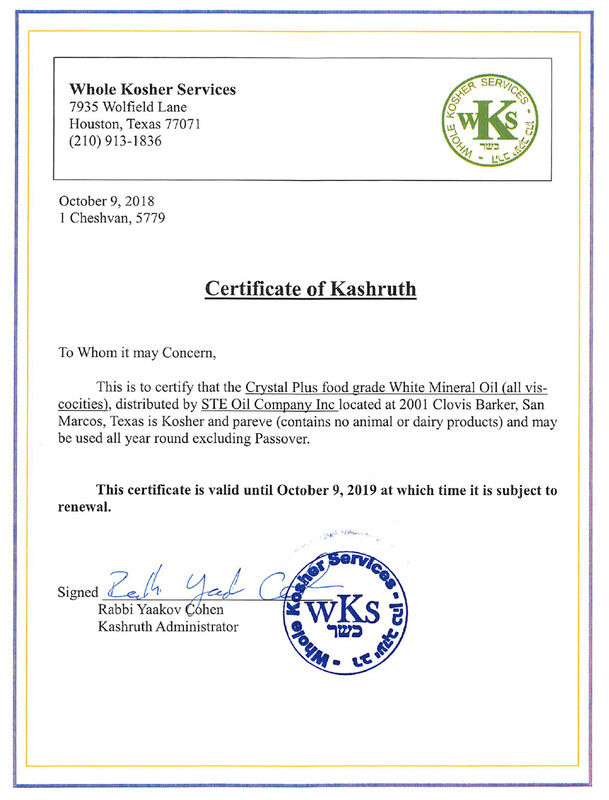 Crystal Plus 350FG is also Kosher approved. Crystal Plus 350FG is the highest viscosity of mineral oil STE offers. Crystal Plus 350T is an odorless, tasteless, crystal clear, technical grade white mineral oil. It meets or exceeds requirements of US FDA regulation 21 CFR 178.3620(b) mandated for indirect food contact. Additionally this oil also meets USDA requirements for H-1 lubricants for incidental food contact. Great value for those applications that do not require food grade oil but still would like the same quality. Crystal Plus 350T is the highest viscosity of mineral oil STE offers. Crystal Plus 500FG is an odorless, tasteless, crystal clear, food grade white mineral oil. Crystal Plus 500FG meets or exceeds requirements of US FDA regulation 21 CFR 172.878 and CFR178.3620(a) for direct and indirect food contact. It meets or exceeds standards of the US Pharmacopoeia (USP) and the National Formulary (NF). It meets standards for approval as H1 and 3H lubricants for use in food plants under the jurisdiction of the USDA. Crystal Plus 500FG is also Kosher approved. Crystal Plus 500FG is the highest viscosity of mineral oil STE offers. Crystal Plus 500T is an odorless, tasteless, crystal clear, technical grade white mineral oil. It meets or exceeds requirements of US FDA regulation 21 CFR 178.3620(b) mandated for indirect food contact. Additionally this oil also meets USDA requirements for H-1 lubricants for incidental food contact. Great value for those applications that do not require food grade oil but still would like the same quality. Crystal Plus 500T is the highest viscosity of mineral oil STE offers. STE Oil Company’s Showgold Plus oil is once refined soybean oil with ethoxyquin added as a preservative. Our Showgold oil is an excellent ingredient to add to animal feed to enrich animal coats. Showgold Plus is specifically designed for use in high-end finish feeds. Along with the added energy for feed formulations, our soybean oil is high in crude fat and total fatty acids. Use of soybean oil will reduce bricking in bagging of feeds in feed manufacturing plants. STE Oil Company’s soybean oil is once refined degummed soybean oil with ethoxyquin added as a preservative. It is suitable as the limpid oil portion in caulks and mastics. Our soybean oil is an excellent release agent for molds in industrial applications. Used as a carrier for agriculture insecticides our soybean oil proves to be most effective. Soybean oil has a large array of uses and applications. Mag Plus is made from a naturally occurring hygroscopic mineral, Magnesium chloride. Mag Plus is sprayed directly onto the surface requiring treatment. Its hygroscopic properties bind the fine, solid particles to the larger soil particles by absorbing moisture from the air providing you with the maximum dust control. Mag Plus saves you money by reducing the need for watering and soil replacement, Mag Plus also improves relationships with the surrounding community when sprayed on dusty roads, fields and arenas. Additionally it improves the cleanness of the surrounding areas. Mag Plus is an environmentally friendly product and can safely be used in the most of sensitive areas. Mag Plus can be used in animal stalls, horse riding areas, dirt roads, and many other surfaces. 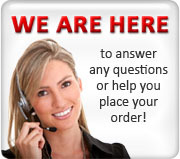 Call us today for pricing at 1-800-967-1931. Your Clear Source for White Mineral Oils. © Copyright STE Oil Company, Inc. AllRights Reserved.